The fifteenth in the series continues the same formula of good close-up photos plus wartime photos. Many of the in action photos are one to a page which allows the details to be clearly seen with the large photos while the close-up detail shots are usually two or four to a page, still large enough to clearly see the details. Each page has brief descriptions at the bottom of each picture. This first section covers the 41WLA and 42WLA Harley's with side profile photos of the two followed by numerous wartime in-action shots which not only show the bikes with many different equipment and stowage fits but also shows the varied uniforms worn by the riders and finally a series of detailed walk around photos of the 42WLA with excellent shots of the frame and engine. Just the thing for the new Italeri kit (#6433) this section is entirely wartime action shots of the three 6-Rad versions plus a few pages with extracts from the tech manual for some good details. While all the photos are semi-close-up action shots they are large enough to show a reasonable amount of detail but there is no specific walk-around type details shots, not withstanding this the details will be useful for these vehicles that have not had a lot of coverage elsewhere except in specialised publications. This extensive section has many wartime action photos of Chaffees from NW Europe to Korea and again the large photo format allows for good details of the vehicles, the stowage fit and crew uniforms that will be most useful. 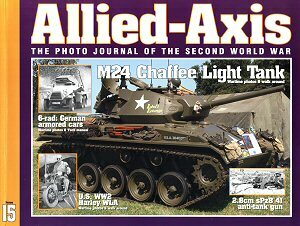 Following this are 23 pages of incredible close-up walk around photos of a preserved Chaffee detailing the entire exterior with 2 or 4 photos per page plus the hull and turret interior and looking into the engine compartment for an excellent photo coverage that will keep most modeller's happy. This final short section has a few wartime photos of the 2.8cm 41 on ground mounts and mounted on a Sd.Kfz.250 plus some nice walk around detail shots of a museum gun on ground mounting that should prove useful. In all another great issue of this series, which are a must for serious armour fans. Thanks to Ampersand for the review copy.